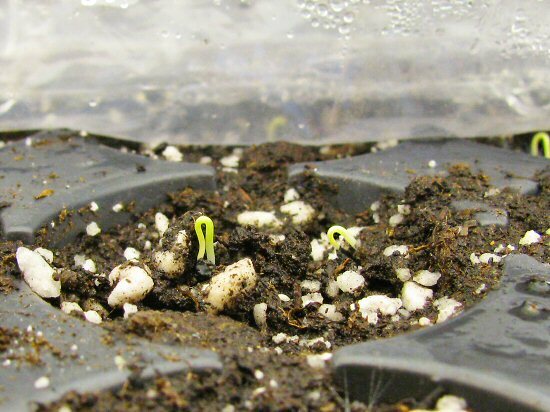 If you’re journaling your gardening seasons, on paper, online, or simply in your head, you just HAVE to take note of the very first seedlings to emerge. Of course, you can’t actually catch the VERY first one, unless you’re kind of mono-focused and a little…obsessive. But a few always come up at about the same time, and a little ahead of the pack. On this tiny farm, I’m there to snap ’em. This season, the Red Globe onions take the prize. There is garlic out in the field from fall, here and at another location, and tiny tips may already be poking up, especially with the UNSEASONABLY mild, warm and low-snow winter we’ve had so far. For 2010 purposes, though, I’m not stalking the garlic patch, only peering at the plug sheets. So there we are, four days after first seeding. Some seed exposed at the surface did show up yesterday, the white radicles looking unnaturally glaring and exposed, but today’s the day for “proper” first seed action. They still work! Do you just use the florescent bulbs only or mix them with Grow Lux bulbs? I see that you use the same flats to grow seedlings that we do (though you certainly use many more – our garden is about 1/8th acre). I’m wondering if you have found an effective way to water them from the bottom instead of just watering from above and leaving the leaves wet and susceptible to diseases. If you have, would you do a post about it? Because I can’t figure out a reasonably quick way to do it. Thanks in advance! Aside – I really love your website. When articles start appearing, you know that spring has sprung! It is wise for the entrepreneur and commercial sector to get involved in the agriculture area, in an innovative and low-environment –impact way. I leave you here a Costa Rican’s company site, which is dedicated in that way to the agriculture area: . Please leave comments! Vakees: I use Cool White fluorescent bulbs, I think that’s all you need for starting seedlings. Here’s a whole long discussion about seed starting under lights and there’s more about which lights to use elsewhere on the net. I’ve tried supposedly full-spectrum grolights and they don’t seem to make a difference, except in cost! But, use ’em if you have ’em, and definitely experiment if you feel the urge! Kevin: I’m STILL using this single plug sheet watering tray, the exact same one I’ve had for years. It’s not too efficient, but I kinda like the ritual of doing one after another after another after another, while doing other stuff as well. But we may finally get around to building a bigger tray, maybe wood with a plastic lining, on a slight incline with an outlet for drainage…this season! Ok, so we HAVE to water them one flat at a time, huh :(. Darnit. Ok, it’s time to go to the store and see if i can find one of those cool trays you have. Thanks for the good advice! I love your blog, lots of good info here. Do seed starting flats have to be under a grow light what about a window? Thanks for the info Mike. I will go with the regular floroscent lights and omit the grow lux. Those grow lux lights are almost double the price. ps: I got my 4 bulb fixtures at Habitat For Humanity for $5 each! Oh yes! that is just one of the most exciting things to see all year! After such a long and dismal Winter it reassures me that everything is starting again! I also have camera in hand when the seedlings begin to sprout. I just snapped pics of my rhubarb and multiplier onions yesterday. Not quite the same as seedlings but it is a sign of spring here in Upper Michigan. I have two trays of 72 seedling plugs. What percentage of the seedlings need to emerge before I put under full spectrum lights? I only have about 8 seedlings per tray and didn’t know if i should keep the tray in the dark to germinate or go ahead and put under the lights. Don’t know if little Lynn mentioned it, but I’ve got my very very own yard! (a tiny one, but MINE!) Last night I started some plugs- mostly just some barrier-type plants for the nosy neighbour.. and some herbs, tomatoes and the like… Thought of you as I set up my trays. are you going to be at the same markets as last year? My tiny little backyard farm got even smaller this year—we put in a patio, wood-fired pizza oven, and a BBQ counter area and landscaped with native plants over the rest…so now my farm is nano-sized–just the planter in the alley behind the house…but still, we have tomatoes sweet potatoes, greens, onions, asparagus…and I’m even thinking of putting sweet potatoes in between the tire ruts …what the heck, eh? Do you apply any organic or bio-organic fert in your farm? LMB: That sounds cool! If you email me a couple of photos, I’ll post one. Pics from other tiny farms would be fun. Agromasportal: Last year, for the first time, we used certified organic alfalfa pellets. This year, it’s back to composted manure, with the last of the alfalfa. And I’m continuing to work on more serious green manure. Finally, spring! I love the picture and always take shots of my flowers as they come up. Do you use anything to protect your flowers and plants from bugs? I saw Safer Brand EndAll spray online and would love to hear your thoughts. I like that it targets so many different pests. Thanks! @ kevin All i can say you can use the hydroponics method to water your crops or plants with the organic nutrients fed to the plants regurlarly. Hydroponic method gives you a unique platform to grow your plant in water medium and getting all the supplements through water itself rather than soil. Yay! We have same first love– I love growing seeds as well. I have a small vegetable garden in the backyard. The first seeds that I have plant ever in my life are the mustard seeds. At first, I was hesitant to plant any plants because I don’t know how to plant in the first place. But with the help of my mom who loves to make her garden green and beautiful, she taught me something about plants. My mom’s technique to plant seeds is to have this seeds spout in a container with water. After 1 or 2 days, I can actually see that the seed has aril and it is already germinating. My mom would now put this growing seeds in the soil. I cannot believe but I was really amazed that even without soil, seeds can still germinate soaking in water. That is a really cool story about your Mum teaching you how to grow plants. It is a really good gardening technique. Hi there! What a cool community, I know I can learn more in vegetable gardening here. BTW I love the picture, glad to see a big farm with new ways in growing vegetables! The seeds need moisture and water in order to germinate, they do not need light. Only after germanitaion to produce food for themselves and oxygen. Congratulations on your planting! Growing seeds is simply pleasurable. Thanks for sharing your planting experience. In addition, did you place fertilizers in your soil? Spring is love.